OSPF is a fast-converging, link-state IGP used by millions. OSPF forms adjacencies with neighbors and shares information via the DR and BDR using Link State Advertisements. Areas in OSPF are used to limit LSAs and summarize routes. Everyone connects to area zero, the backbone. OSPF is the most widely used IGP. When we discuss IGPs, we’re talking about one routing domain, or Autonomous System (AS). Imagine a medium-sized company with multiple buildings and departments, all connected together and sharing two redundant Internet links. All of the buildings on-site are part of the same AS. But with OSPF we also have the concept of an Area, which allows further segmentation, perhaps by department in each building. Adjacency: a two-way relationship between two neighbor routers. Neighbors don’t always form adjacencies. ABR:- An Area Border Router is a router that is in area zero, and one or more other areas. DR, BDR:- A Designated Router, as we said, is the router that keeps the database for the subnet. It sends and receives updates (via multicast) from the other routers in the same network. ASBR:- The Autonomous System Boundary Router is very special, but confusing. The ASBR connects one or more AS, and exchanges routes between them. The ASBR’s purpose is to redistribute routes from another AS into its own AS. – It encapsulates original packets into a new header. For example, IPSec VPN, an overlay technology, encapsulates original IP frame in another IP header. – Communication is typically established between two tunnel end points. For example, in an IPSec based VPN, which runs on the public internet, the tunnels are established between two sites. When you apply those overlay technology traits to VXLAN, you will see that VXLAN encapsulates original MAC frames in to a UDP header (shown below), and all vSphere hosts participating in VXLAN acts as tunnel end points. They are called Virtual Tunnel Endpoints (VTEPs). 1) VMware Installation Bundle (VIB) or vmkernel module – VTEP functionality is part of the VDS and is installed as a VMware Installation Bundle (VIB). This module is responsible for VXLAN data path processing, which includes maintenance of forwarding tables and encapsulation and de-encapsulation of packets. 2) vmknic virtual adapter – This adapter is used to carry control traffic, which includes response to multicast join, DHCP, and ARP requests. As with any vmknic, a unique IP address is assigned per host. The IP address is used as the VTEP IP while establishing host-to-host tunnels to carry VXLAN traffic. 3) VXLAN port group – This is configured during the initial VXLAN configuration process. 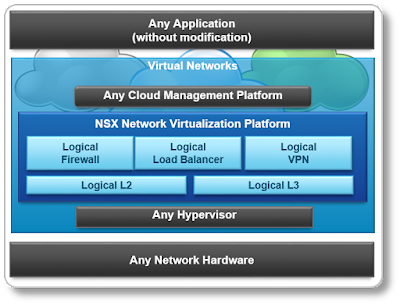 It includes physical NICs, VLAN information, teaming policy, and so on. These port group parameters dictate how VXLAN traffic is carried in and out of the host VTEP through the physical NICs. 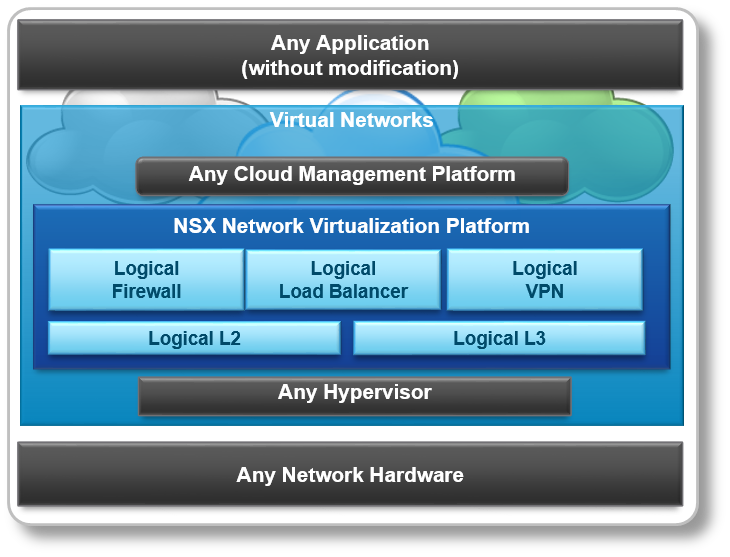 NSX is a network virtualization platform that you can use to build a rich set of logical networking services.